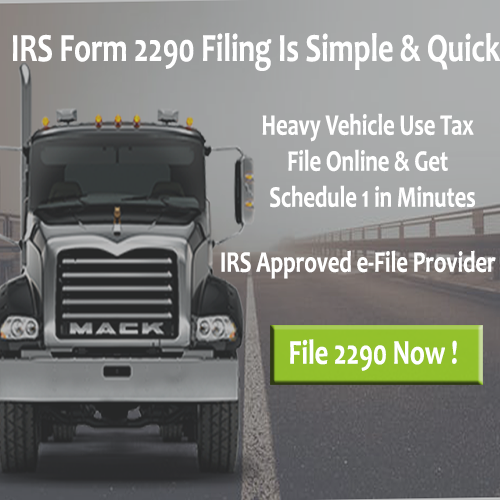 Form 2290 Online Filing used to pay Federal Heavy Vehicle Use Tax to an IRS. Federal Form 2290 Tax also called with different names such as HVUT 2290, Federal Heavy Highway Vehicle Use Tax Return and so on. If any highway motor vehicle registered on your name then you must liable to File 2290 Online. The heavy vehicles subjected to 55,000 pounds or more weight must be filed with an IRS and need to pay 2290 Tax. Form 2290 Heavy Highway Vehicle Use Tax should be paid in between the July 1 to June 30 of the following Tax period. If you want to know the clear details of Form 2290 Filing, go through the below sections and then start your 2290 Online Filing. E File Form 2290 if any vehicle taxable gross weight is 55,000 pounds or more. Report the vehicles whose gross weight is 55,000 or more to an IRS by paying Heavy Highway Use Tax. 2290 Tax Form also filed if the vehicle mileage limit exceeded then the instructions given by an IRS. If mileage limit of vehicle exceeded then 5,000 miles then one must File & Pay 2290 Online. 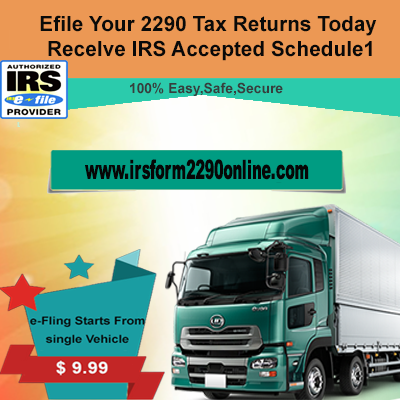 You can also Pay IRS Taxes Online with Form 2290 if your vehicle gross weight increases and falls into a new category. Inform about the increase in gross weight with the HVUT Form 2290 and pay the 2290 Heavy Use Tax to an IRS. With the help of 2290 IRS Form, you can claim a credit if your vehicle is stolen, sold or destroyed. Also if the mileage limit does not exceed then 5,000 miles or 7,500 miles for agricultural vehicles then also you can request a credit from an IRS by using 2290 Tax Form. Furthermore, you can also claim credit for the vehicle that traded out for the current tax period by using IRS Tax Form 2290. What you need to File Form 2290 Online? You must gather the below needs to File 2290 Online. Efile Form 2290 by entering all the required details. Collect VIN Number of a vehicle, gross weight of a vehicle, your Address & EIN Number are the mandatory things to File IRS Form 2290 Online. Form 2290 Filing finishes when you enter these details in the 2290 Form. 3. Gross weight of a vehicle. Filing Form 229 0can be done with paper or with Efiling. IRS also shows interest on E File 2290 as it a time & money saving process. You can finish your filing within five minutes if you choose to File 2290 Online. Efile Form 2290 and receive immediate Schedule 1 within minutes. 2. Enter your business information. 4. Receive your 2290 Schedule 1. Some states allow you when you have your proof of HVUT Payment. An IRS provides a proof for your 2290 Filing i.e, IRS Stamped Schedule 1. You can receive your Schedule 1 immediately after an IRS accepts your filing. Take a printout of IRS Schedule1 and freely roam on the public highways. File Form 2290 through IRS Form 2290 Online for the best, fast, and secure Form 2290 Filing. It’s time to E File Form 2290 to avoid extra penalty. Therefore, start your Form 2290 Online Filing now and Receive 2290 Schedule 1 Proof. You can get all the benefits of 2290 Filing if you file from an IRS Form 2290 Online site. Without any late, quickly start your Efiling 2290 with more security. 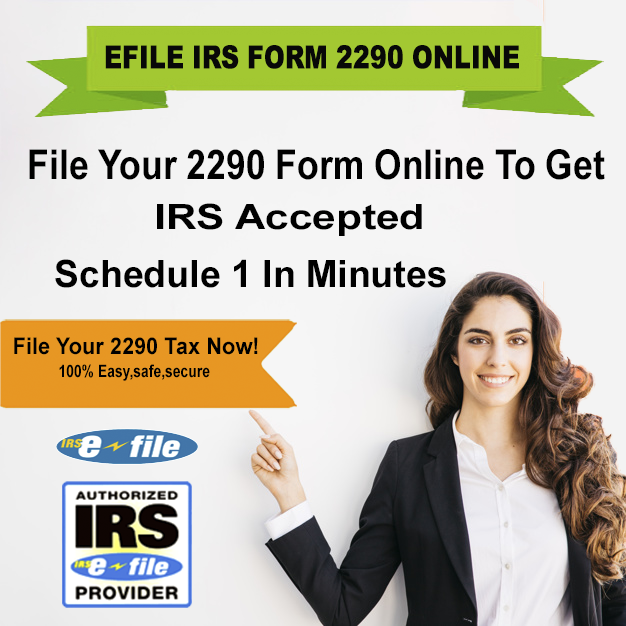 We are the best IRS 2290 Efile Providers to finish your 2290 Filing easy and fast. Connect us with (316) 869-0948.